Slither.io which was developed by getting inspiration from Agar.io also take the old viral Snake game as a base. The slither.io logic is quite simple. Collect the orbs around you and grow bigger. Meanwhile you have to protect your head from your enemies as well. You will be eliminated if you will hit to any snake with your head and you will have to re-start to slither.io game. We just wanted to prepare a small slither.io guide for those who began to newly play slither.io. Do Not Escape from Action! If you will want to grow by simply collecting the orbs around you without dealing with your enemies, this will take some time. If you will hang out between the other snakes carefully, you can grow faster with the remainings of them. Do Not Afraid of Bigger Snakes! You may be terrified when you see bigger snakes around you but you will have plenty of advantage in the event that you will keep your distance between them. You can move quickly since you are smaller and escape from their moves. Just be sure to not be caged with them. Collect the Remainings of Eliminated Snakes! Many snakes are eliminated every minute in slither.io and they leave great tresure behind them. Do not forget to keep chasing them. Try to Speed Up on Time! Try to speed up on time and wisely by leaving some of your parts behind. You can even trap the bigger snakes by cutting the front of them by speeding up. Take the Advantage of the Threats Coming Right Towards You! Sometimes the best offense is defense. You can escape without looking your back once you see a snake that target you. Your priority should be protecting yourself. Of course everybody have their unique slither.io gameplay preferences however even studies prove that playing with mouse is much more easy rather than your fingers. 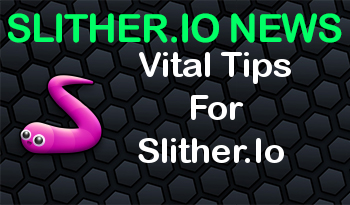 In the event that you will follow these steps and adopt them, you can easily rank in the leaderboard of slither.io.